Cow has noticed many fiction books regularly have their protagonist delighting in meals. And when you're sitting there reading, every time the character has a little snack, you want to get up and rummage in the fridge too. 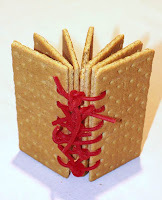 So, logically, books themselves should be edible and just cut out the middle step. As you turn the page, you can eat it. Think of how efficient this would be for travel. Instead of having to bring back books you've packed, once you've read them, they're gone. Cow is a little dismayed to learn that the International Edible Books Festival has been going on since 2000 and this is the first she's heard of it. Thanks to Kevin Musgrove of Helminthdale for bringing this to Cow's attention. Cow might be interested in this too. That's the problem with great ideas - someone has always thought of them first. There are so many adjectives that books and food have in common - meaty, saucy, indigestable, etc. One could make the Encyclopedia Brittanica out of rice paper for intellectual and physical digestion. I think we've found our next idea; we'll combine blogger lunch with book club meetings! Kevin: Dr. Seuss cake? Cow thinks any cake designed in homage to Seuss would be a thing of beauty and yumminess. Library Guy: Cow is quickly ordering a bibliovore shirt. Gorilla:Cow thinks those adjectives could also apply to Gorillas. Or if not, their bananas. Ultra TM God: Rice paper encylopedia--why, slathered with the appropriate condiments, could almost be palatable! Doghouse: blogger blunch grub. Sounds like a great idea! Think how carefully one would choose one's reading selections knowing you would be eating them. And Antiquarian Books would certainly have a niche audience.